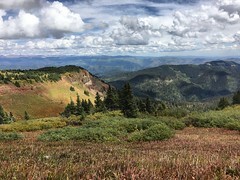 I have been looking at the area to the south of the Black Mountain escarpment for a while now as it is an area which has held a fascination for me. 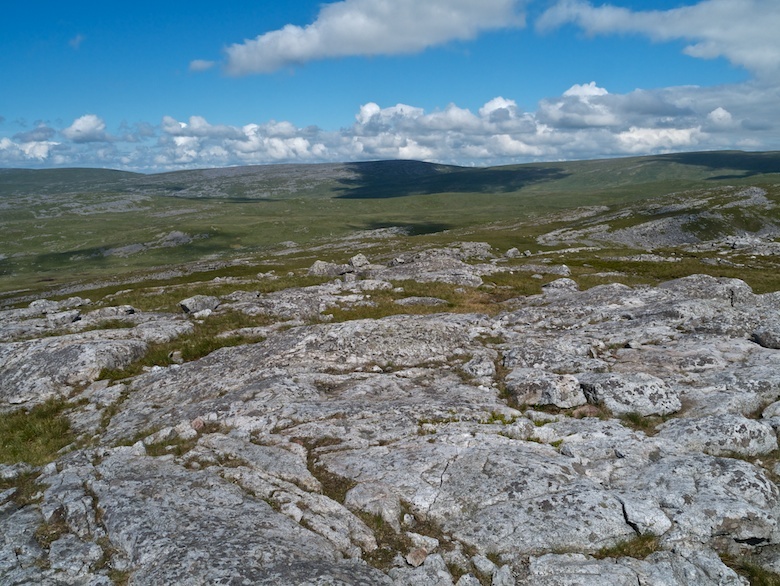 Miles and miles of nothing with large areas of limestone breaking through the earths surface. 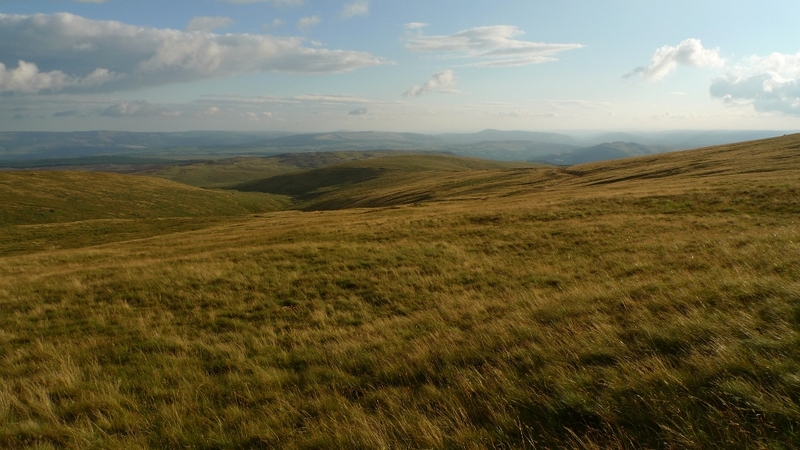 I have tramped the high hills of Fan Brycheiniog and Bannau Sir Gaer in the past, but the sheer bleakness of the land that rises up to their lofty heights has been untrodden by my or many others footsteps. 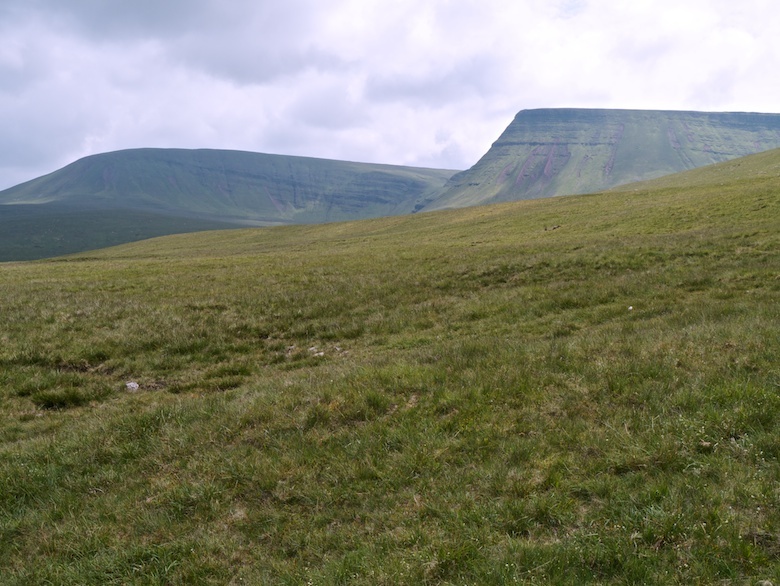 Add into the mix the mountain Fan Gyhirych which eluded me on my last trip to the area due to bad weather and a cracking backpacking route evolved from the comfort of my armchair. For once we were blessed with a good weather forecast, we seemed to be heading for the sunniest spot in the whole of the UK that weekend. In reality that turned out to be another tall tale spun by the Met Office. I did not really know where to leave the van to start this walk, in the end I parked up at the campsite next to the Dan-yr-Ogof caves. 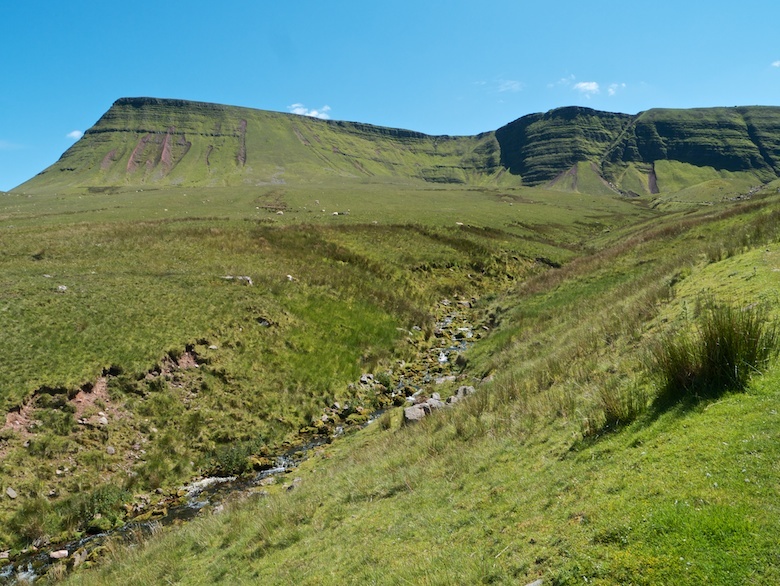 £3 per day gave me piece of mind, it also gave us the spectacle of Dan-yr-Ogof in Augsut. The place was absolutely heaving, I mean really heaving. Surely it must be good to attract such crowds, many of whom were clutching toy dinosaurs. We felt out of place in our hiking gear and backpacks as we made a hasty exit. 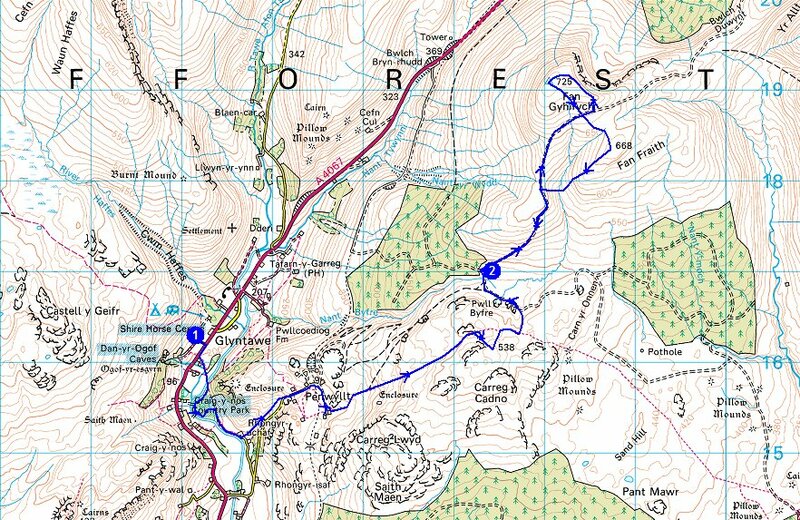 Now the plan was to access the Beacons way via Craig-y-nos Country park, instead we got on the wrong path which was not marked on my map. I then tried in vain to make what I was seeing match the map, until it was glaringly obvious that things were not working out. Some crashing through trees and a hop over a barbed wired fence got us back on track. A pleasant overgrown path soon had us climbing, it was nice to gain height surrounded by trees to then get a sudden view. 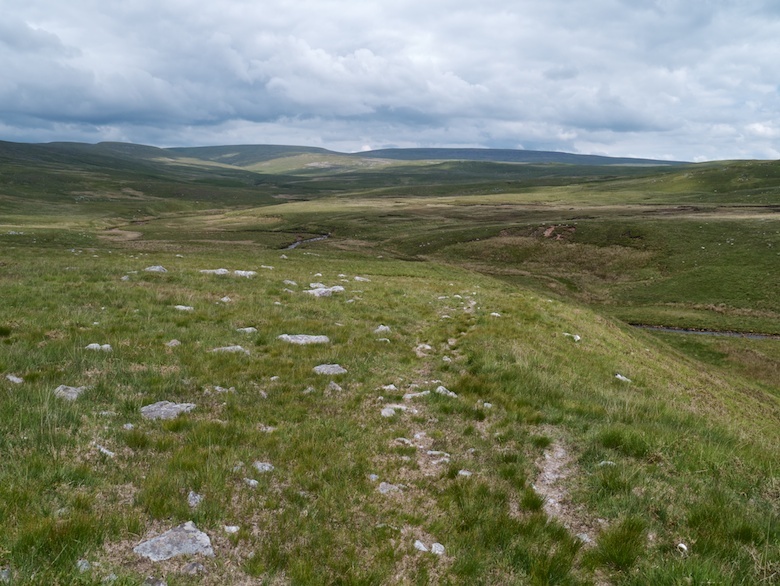 A large quarry was passed and we started ascending the pleasant grassy track across Ogaf-Ffynon-Ddu Pant Mawr National nature reserve (I think that they need to work on the title of that). 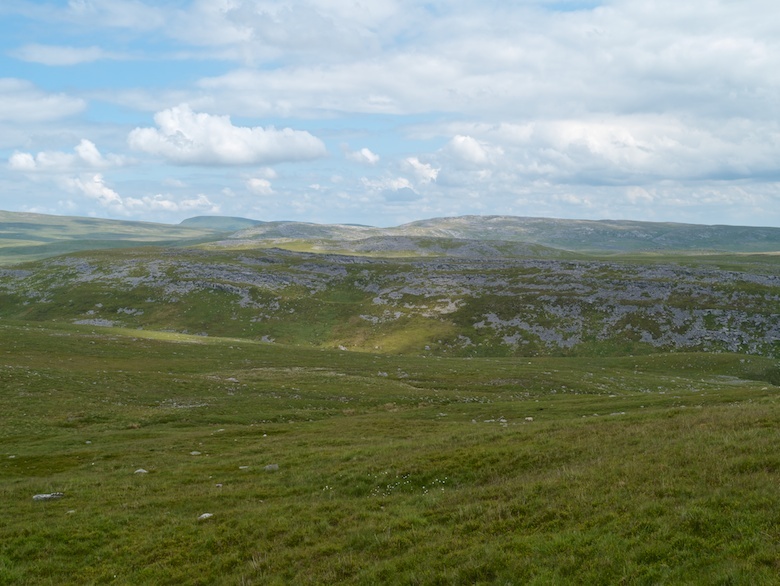 A large area of limestone pavements with apparently one of the deepest cave networks in the UK underneath. 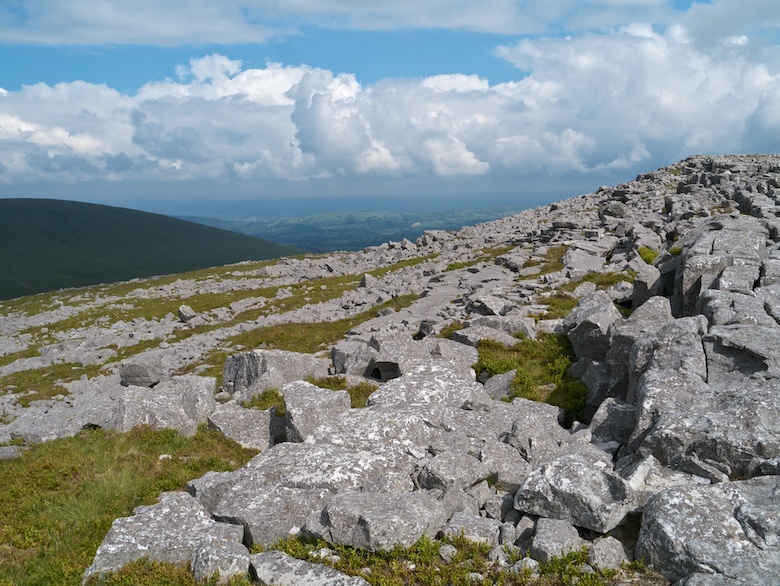 The detour to the summit of Cerreg Cadno was hard work through the jumble of limestone blocks but the views were well worth the effort. 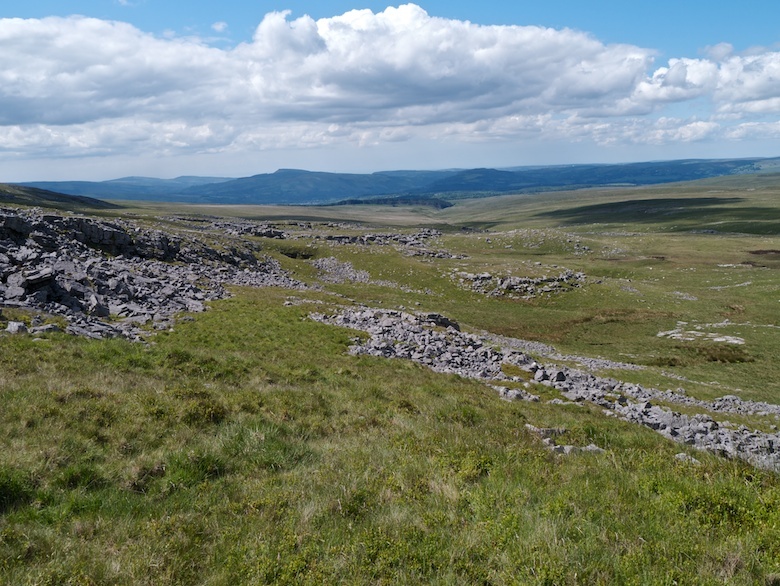 For me wild limestone uplands are atmospheric places and make a change from the usual peat and rough grassland we normally get when up high. The plan had been to camp somewhere between here and the summit of Fan Gyhirych, the wind and what looked like gathering clouds meant we dismissed a summit camp. There was a good area of nice looking green grass to the north of us but that was occupied by a herd of cows, never the best camping buddies. 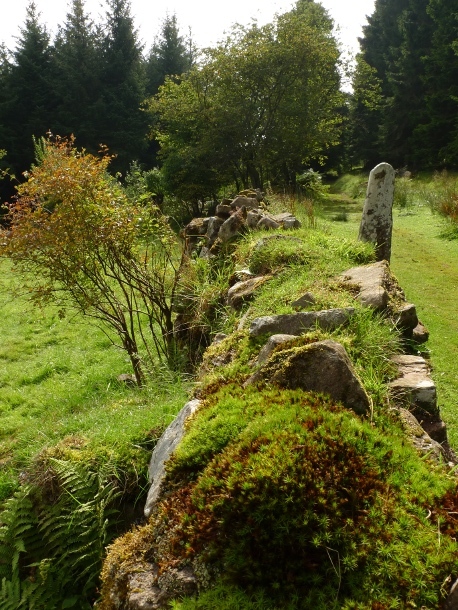 A quick visit to a nice looking cairn and we descended to the track that skirts the bottom of the high valley. 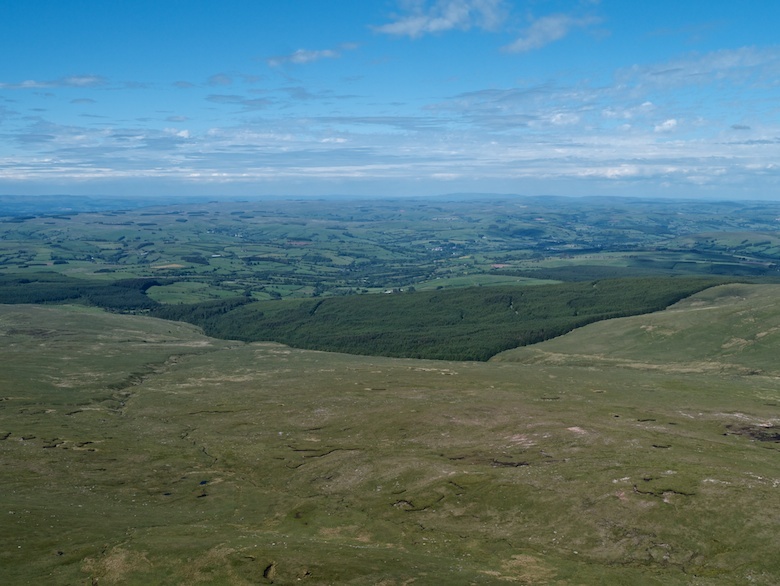 The valley bottom is a sea of bog with a lazy stream running through it, it disappears underground into Pwll Byfre which looks like it is probably an old quarry. 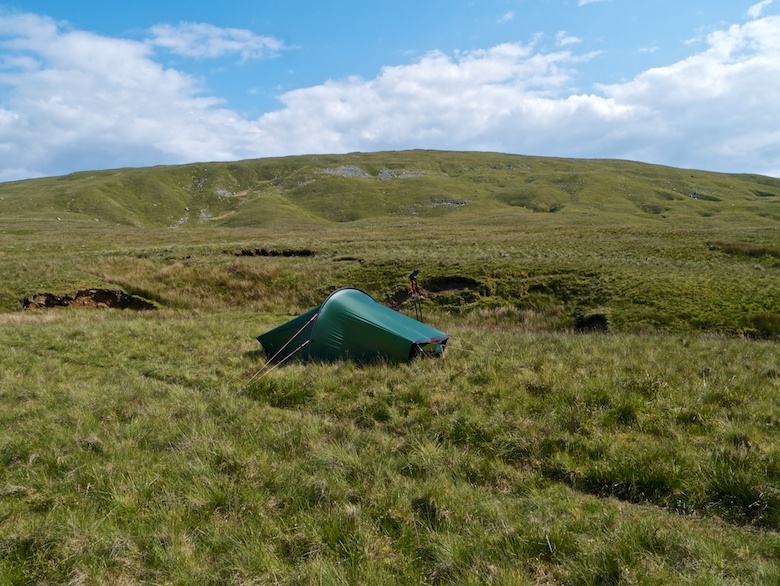 We soon found a large area of short cropped grass near a sheepfold and got the tents up, I was excited because it was the first time I had put my brand new Scarp1 up. 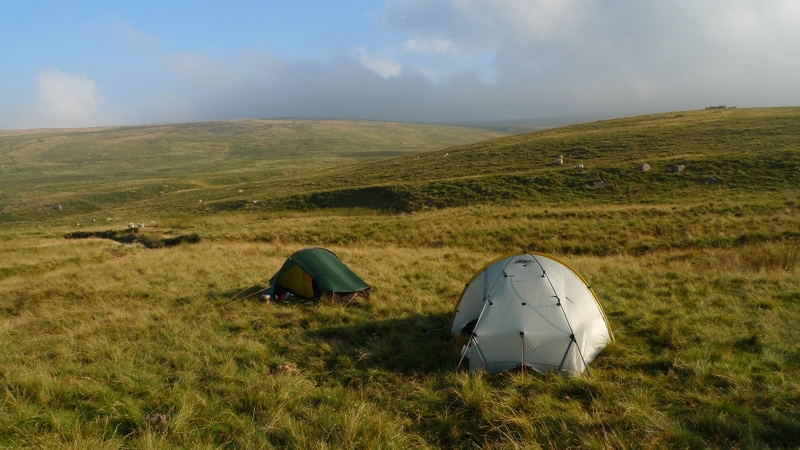 Things were not all well with my new tent, if you wish to read about it click here. 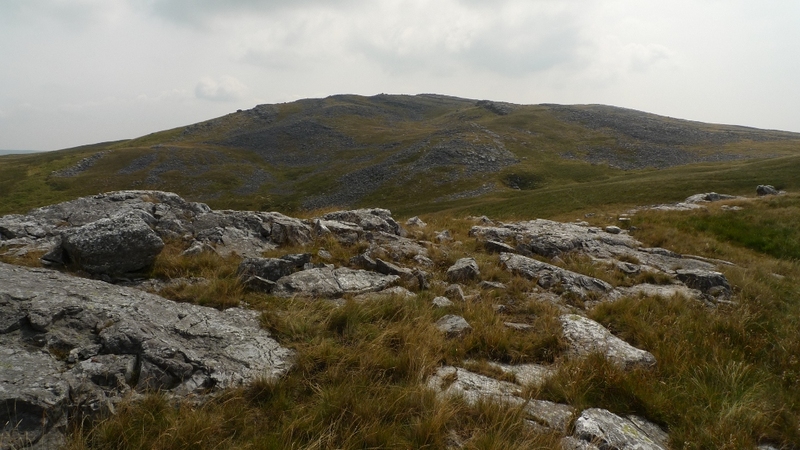 As it was only 6.00pm we decided to head to the summits of Fan Gyhirych and Fan Fraith before settling down for the night. There was more of a spring to our steps as we headed off up the track without the weight of our packs. 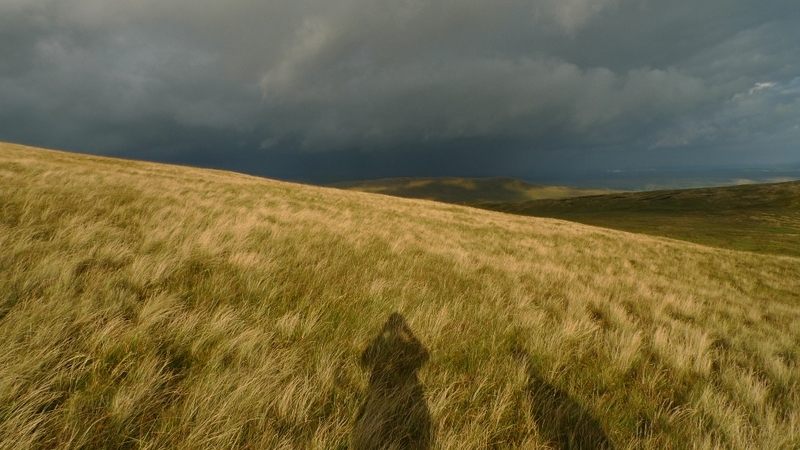 Approaching the top of Fan Gyhirych we noticed that the sky to the north had turned a rather ominous shade of black. Although to the south it looked like the perfect summers day. Suddenly the world was at our feet and we found ourselves sandwiched between the sun behind and the approaching storm. As we watched we saw the distant Pen y Fan disappear into the clouds. We had initially hoped that the clouds were drifting to the east, although it became apparent that they were heading straight for us. A yomp up to the trig point and then back to the track was followed by a short pull to the summit of Fan Fraith, here the rain finally caught up with us. 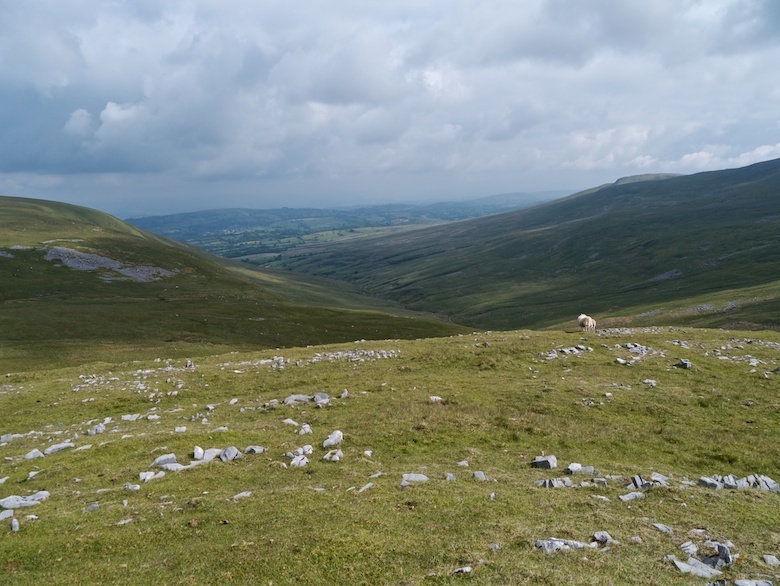 We dropped down to the Byfre Fechan before the track took us quickly back to the tents. Encased in our own nylon worlds we cooked our dinners and swatted at the odd rogue midge that came out to play. 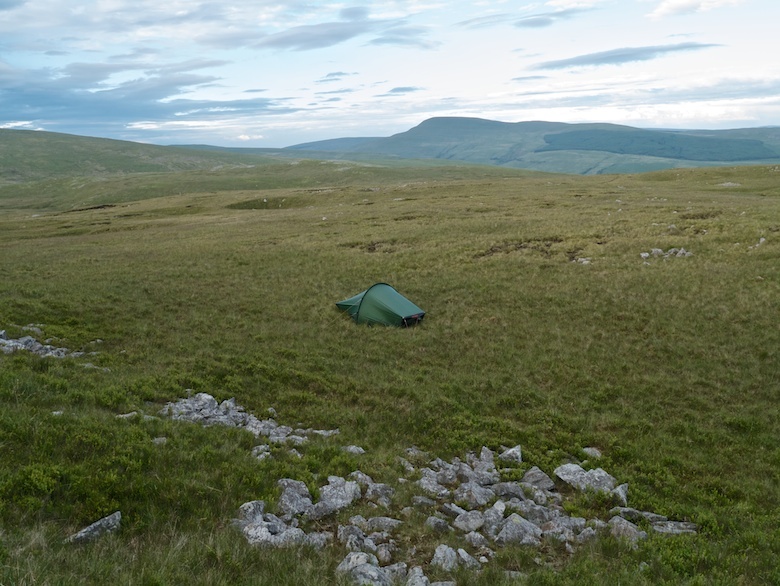 It was during the night that it became apparent that we were on a fair old slope, I spent half of the night retrieving myself from the bottom of the tent. As I constantly shuffled my way back up again I could hear the heavy persistent rain drumming on the flysheet. It rained pretty much all night with a heavy persistence that makes you wonder if it is ever going to stop. There was still light rain falling when I started cooking breakfast. It was a grey dull start to the day. Wet tents were packed away and we started easily enough by following the track west into the forest. 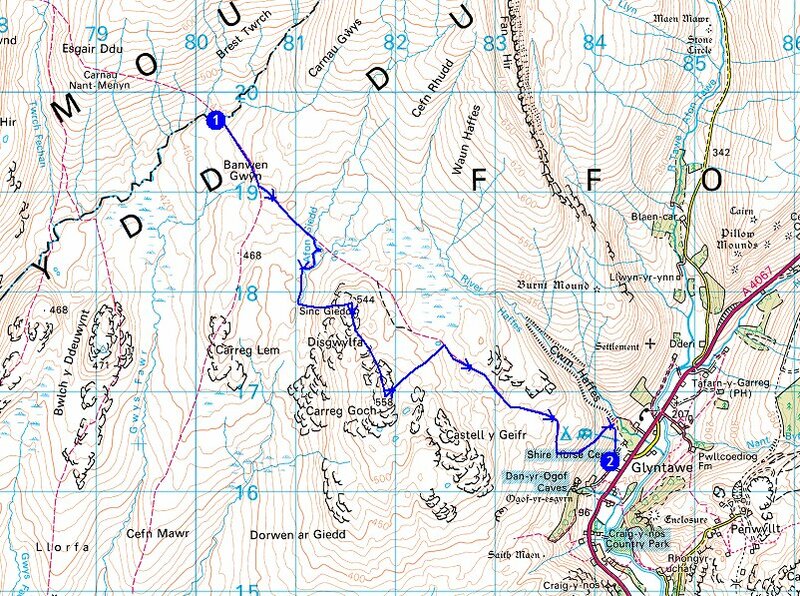 Here I discovered that having your map in your rucksack does not help on the navigation front and we missed our turn. 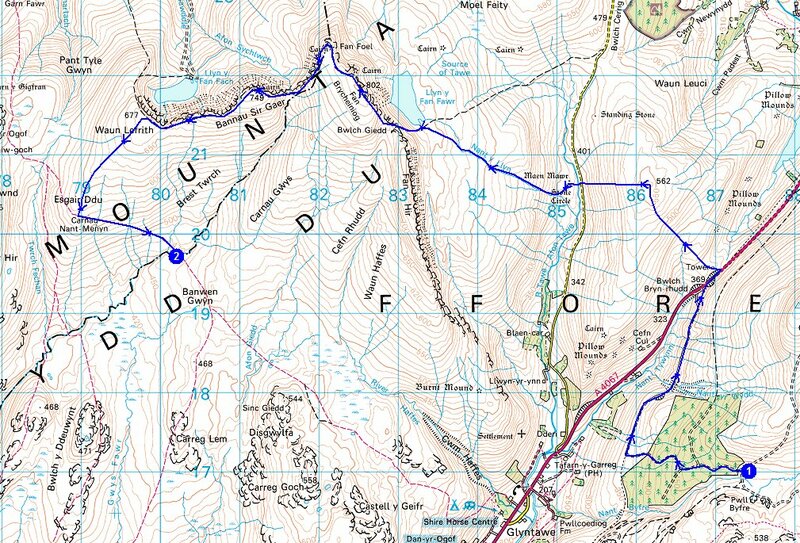 I discovered the error when I realised that we were heading too far downhill, a consult of the map showed that we could head for the disused railway track instead of heading back uphill. 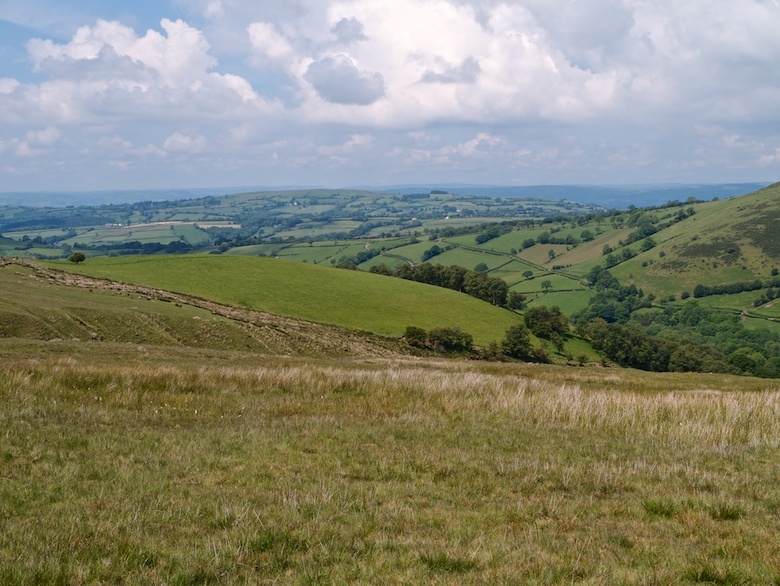 Out of the forest we would see the long escarpment of the Black Mountain ahead, the way being blocked by the low bulk of Waun Leuci. The railway track turned out to be a good route north to the head of the valley, allowing us to cover some distance without much effort. 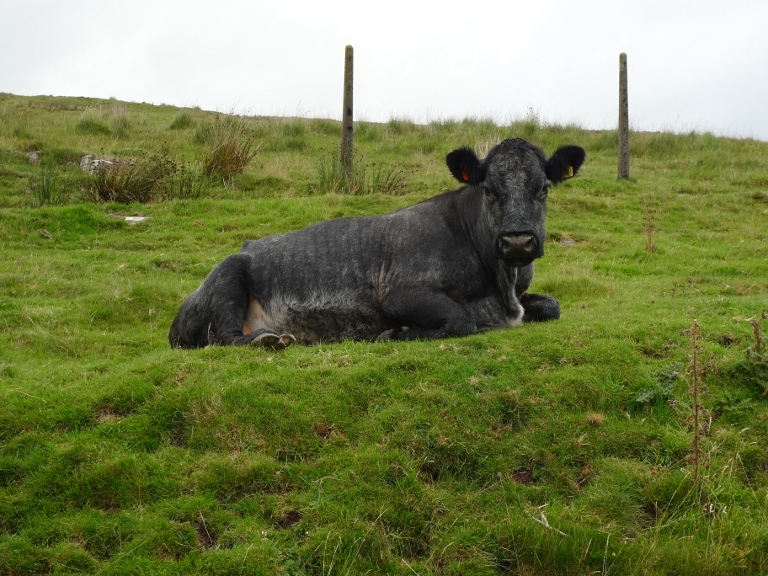 We stood for a while watching a pair of Goldfinches in the thistles whilst a cow watched us. At the head of the valley we reached an old stone tower and started the ascent of Waun Leuci, keen to get it out of the way so we could explore the Black Mountain. A retrospective view back showed just how steep the upper slopes of Fan Gyhirych are, we would have come down that way today if we had not climbed the hill the night before. 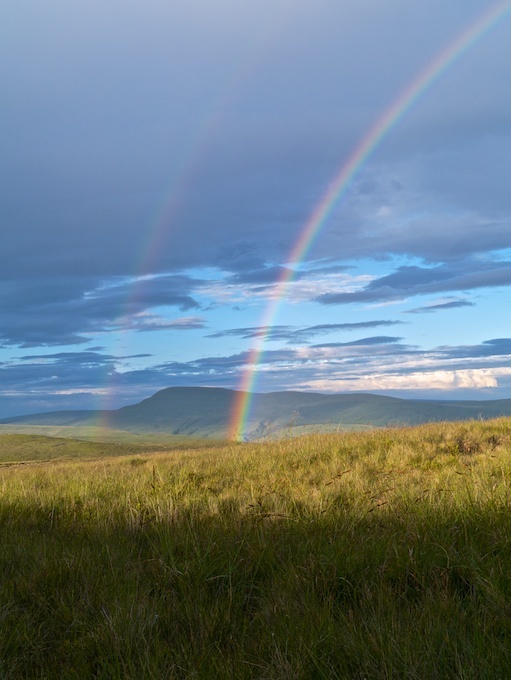 As we descended towards the River Tawe a heavy passing shower got us reaching for our waterproofs, no sooner than we were all kitted out than the rain stopped and the sun came out. 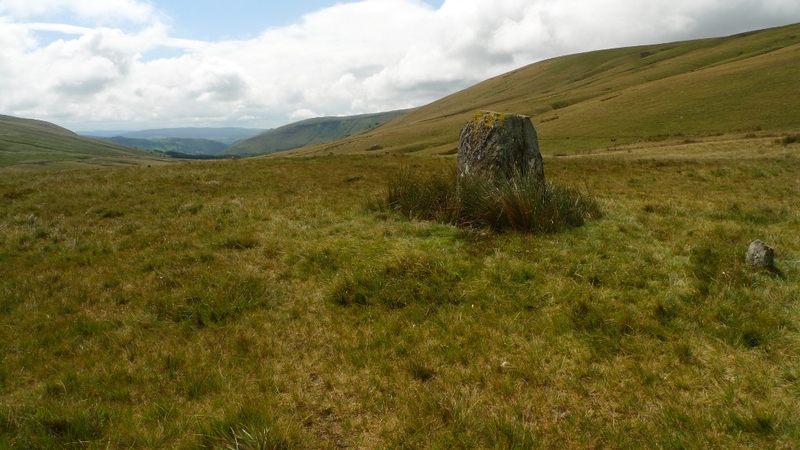 Luckily the river was easy to cross without getting feet wet and we climbed up to the standing stone of Maen Mawr and a tiny little stone circle. 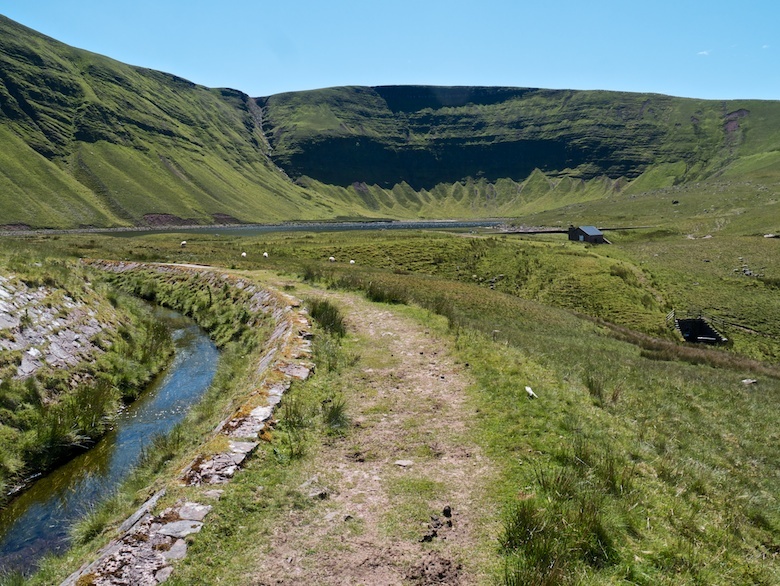 The outflow from Llyn y Fan Fawr cuts a deep course through the hillside, something that is not that obvious by looking at the map. 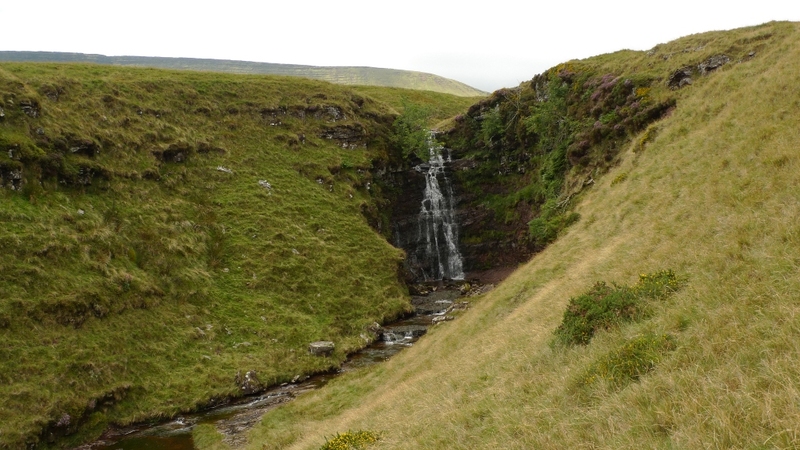 This gives an easy and pleasant ascent on short grass beside a series of waterfalls. If it had have been hot there were several tempting looking pools for a spot of skinny dipping beneath some of the falls. The ground soon levelled off as we approached the lake under the cliffs, once again in the distance the clouds were beginning to brew up. It became a race against time to get to the top before the mists rolled in. 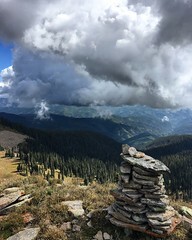 Half way up the rocky staircase the rain won, sweeping quickly in before passing and leaving us with a great view from the summit. 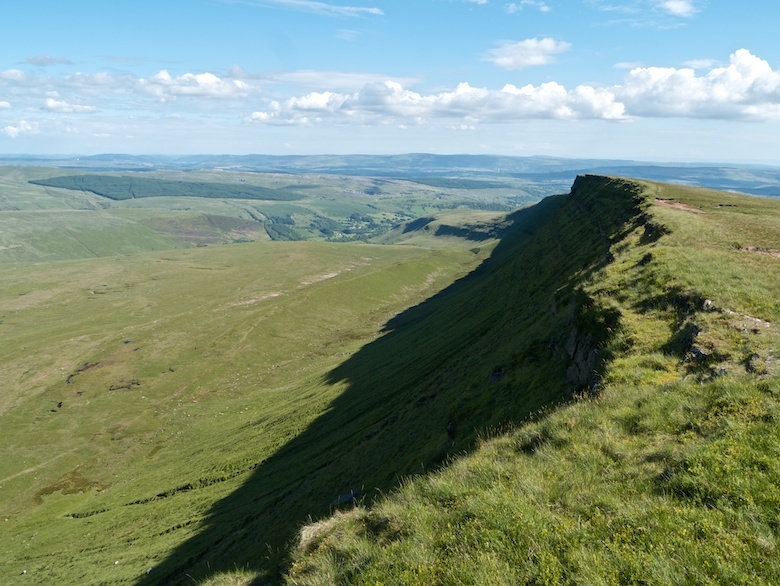 From here is one of the most spectacular escarpment walks in Wales, to the right broken cliffs swoop down to deep lakes whilst to the left bleak moorland gently descends into a wilderness of deep valleys and limestone peaks. 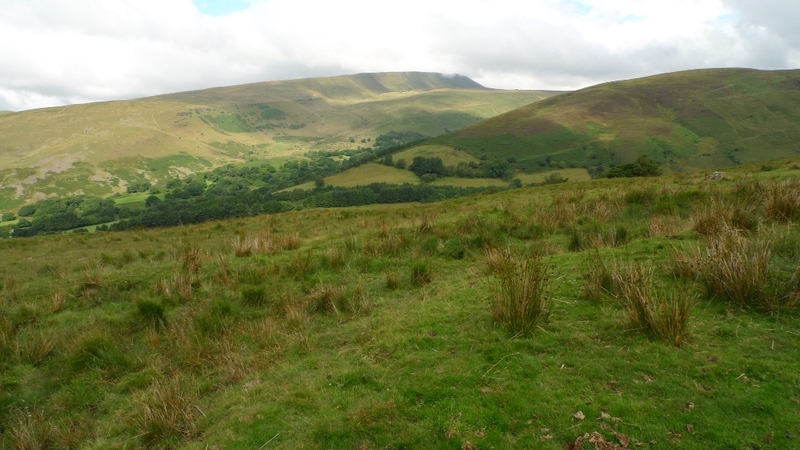 We were looking forward to the walk over Bannau Sir Gaer for the views down to Lynn y Fan Fach. The weather had other ideas for us as once again the sky went black to the north. But this time the rain came in like a solid wall, enveloping us immediately in a dark grey swirling world. It was like a light switch had been turned off. Mist dramatically shot over the summit lowering with dramatic speed, the rain hit us hard like little bullets. I only had a t-shirt under my thin summer waterproofs and I could feel every single drop pummel my skin. For a good hour it absolutely chucked it down taking away the pleasure of the views we had been looking forward to. 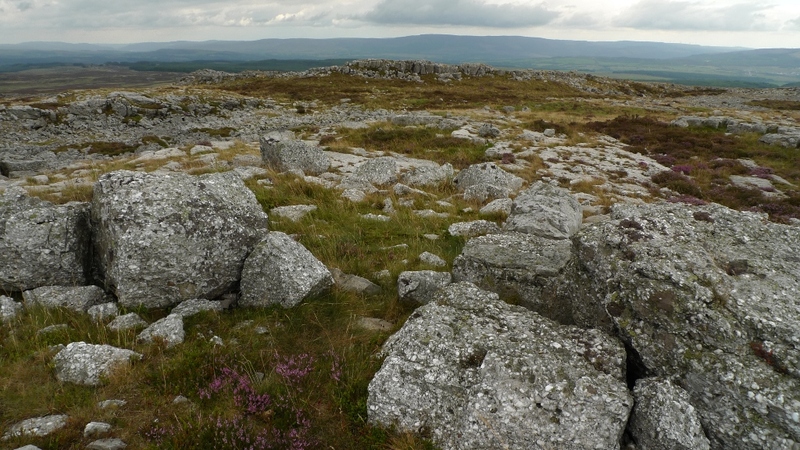 It took a little pacing to work out the exact summit on Waun Lefrith before taking a compass bearing into the mist. 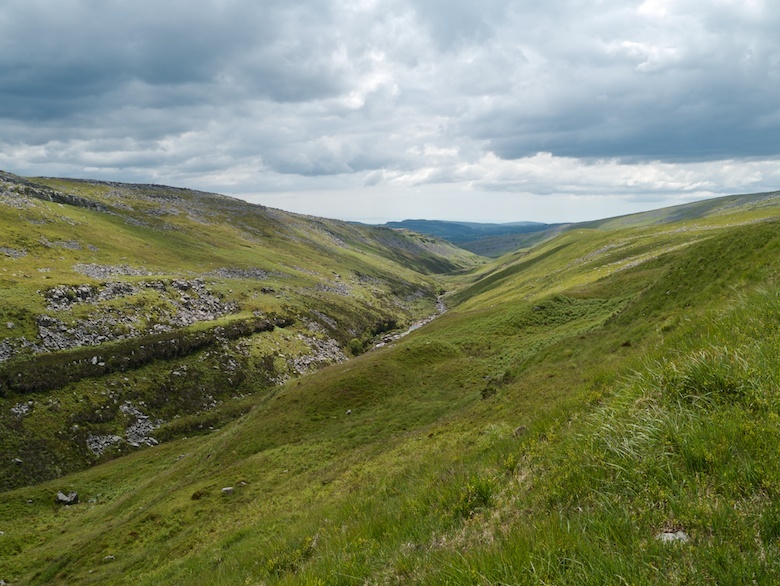 We were now heading off into the wilds and I could only see one hundred metres ahead, I had been hoping for sun and clear visibility for this bit! Half way down the mist cleared and the sun put in an appearance once again. 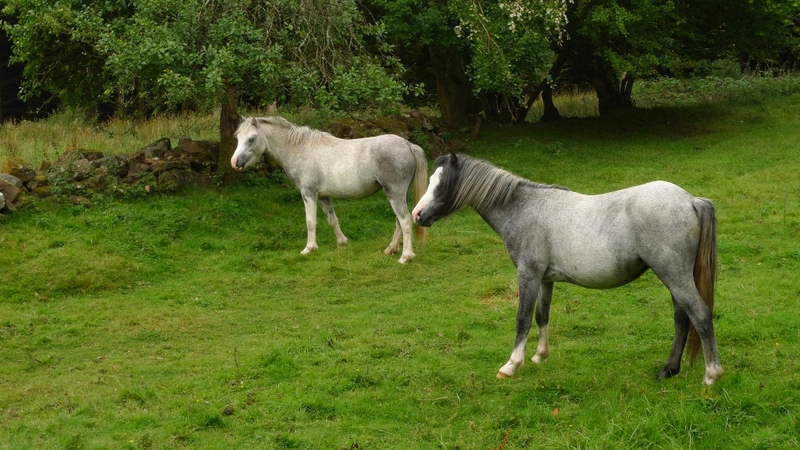 We branched off and followed the rough line of a bridleway towards the upper Afon Twrch where we found a good sheltered flat pitch near to the ford. 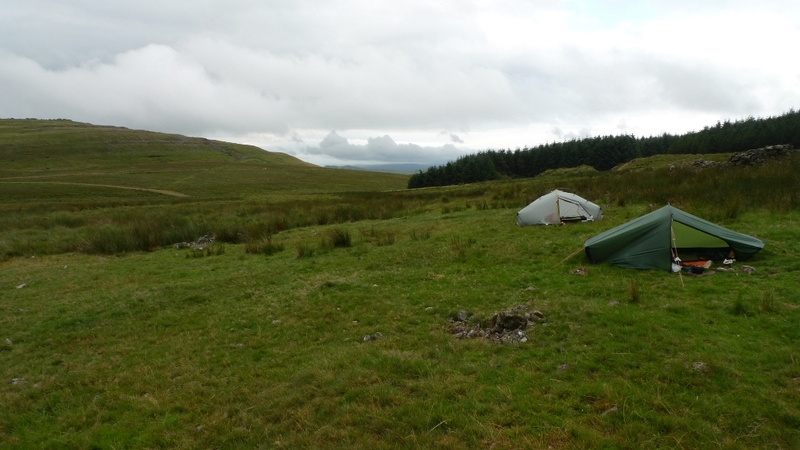 We got our tents up just in time before another heavy shower passed over head. I slept well that night and was thankful not to be sliding to the bottom of the tent every five minutes. 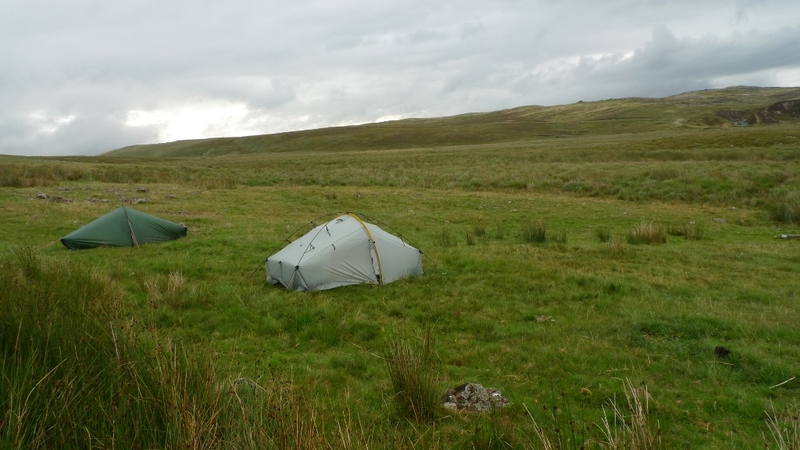 It remained dry but the wind managed to really pick up in the middle of the night, my tent shedding it well with hardly a flap. Warm sun woke me up in the morning and combination of that and high mist made our campsite appear rather atmospheric. 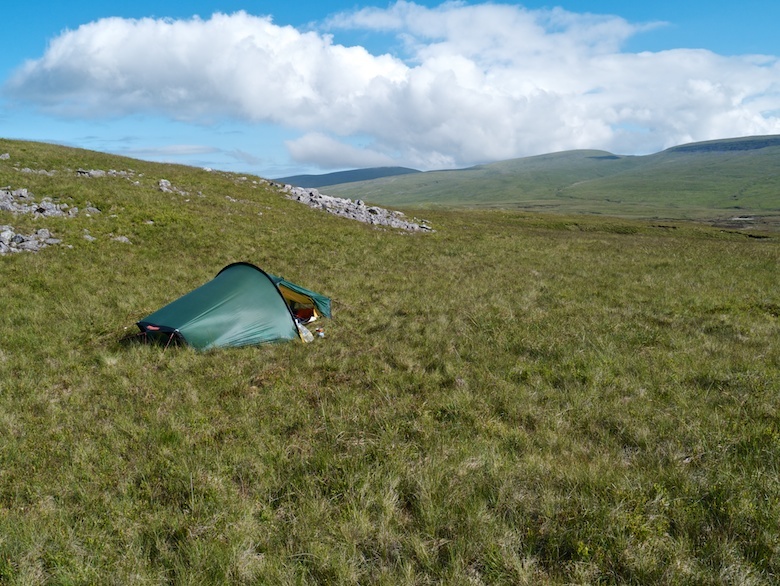 It was one of those relaxing wild camping mornings that I wish could go on forever, some days you just fancy staying in the same spot and lapping up the scenery. A good dose of warm sun and a cooling breeze certainly helped the relaxed feel. However I had nearly finished packing up when it went a little wrong. I suddenly found my breakfast noodles back up on the grass in all their undigested glory. 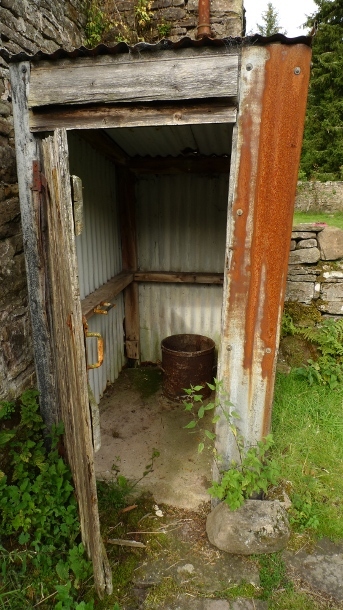 I felt flushed and giddy with a needle filled belly, just what I did not want when backpacking. This was one of the first trips for years where I had been really good at filtering all my water so it shouldn’t be that. The sickness did pass but I had lost the initial joy of spring feeling that had woken me up. Fording the river we took the narrow bridleway up into the hills where we met our first group, it was not even 10am so they must have been up and away early to walk the few miles in from the road. 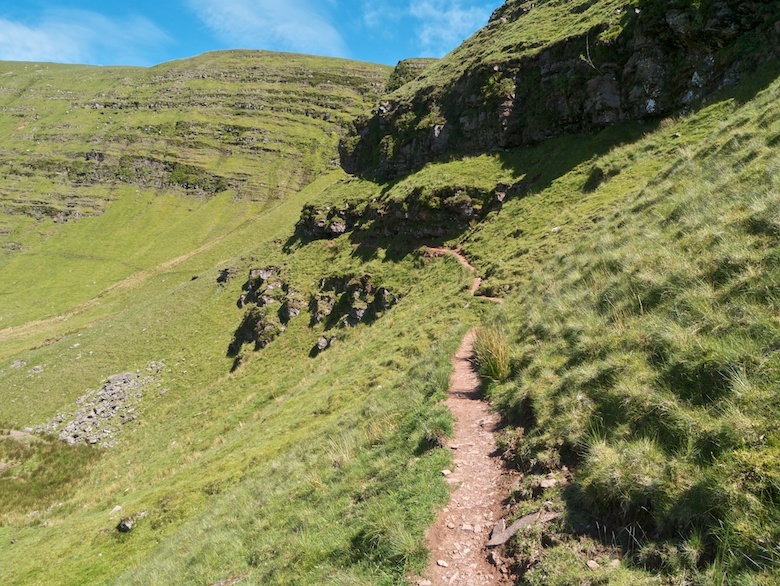 The path descended to the Pwll y Cig, a stream with steep banks and lots of very inviting looking wild camping spots. One of which looked so inviting that I may have to go back in winter just so that I can use it! 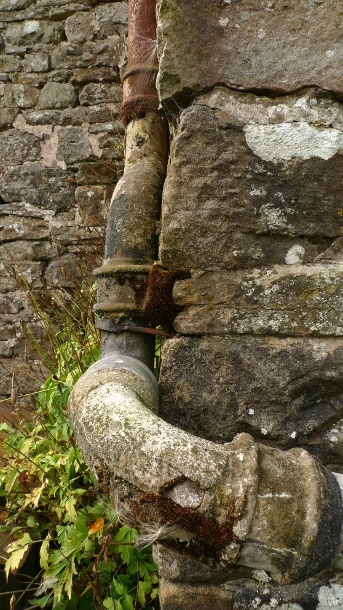 We noticed that the river flows into a swallow hole so decided to follow it, high up on the steep bank. Being limestone the river disappeared before reaching it but the remote area was well worth exploring. There is a beautiful wild remote feeling to this area, something that I could not put a finger on. All that I can say is that it held a weird magical spell over me. I want to go back and explore slowly taking in the atmosphere. A short ascent brought the rocky summit of Disgwylfa with its views of the bleak hinterland. 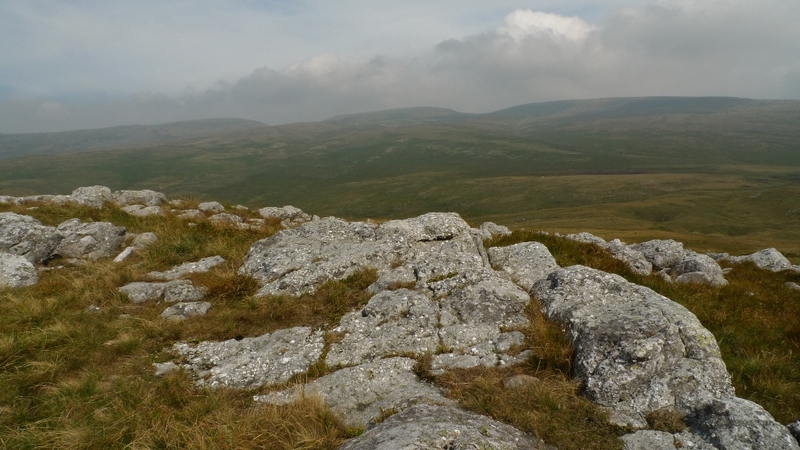 And towards the next minor peak on the ridge, Carreg Goch with its outcrops of limestone. An easy descent east towards the track back down into the valley took us past massive shake holes that were perfectly circular, looking all the world like giant bomb craters. 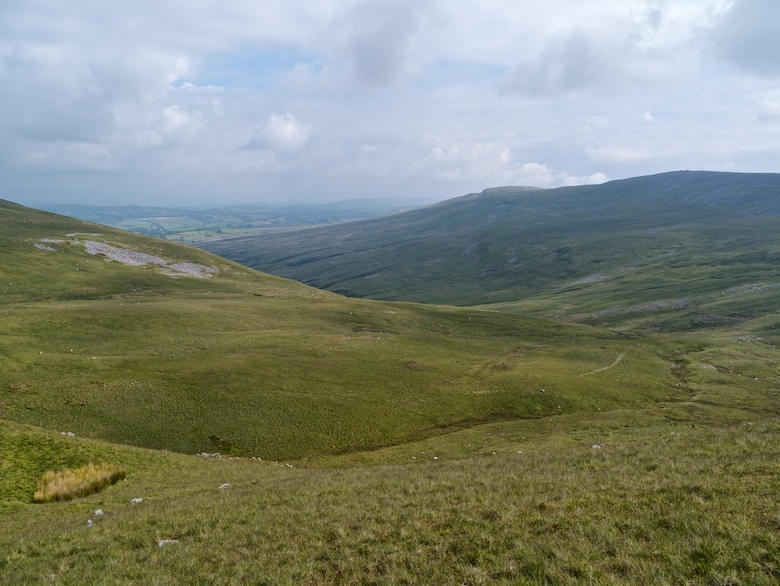 The track was a perfect grassy delight as it led downhill through an increasingly green landscape, limestone outcrops reminding me of the Yorkshire Dales. We braced ourselves for the chaos of the showcaves car park but strangely it was almost deserted and calm prevailed. Even the campsite looked rather attractive now that it was not surrounded by a sea of vehicles. A hot and sunny finish to a great weekend among some pretty special hills. 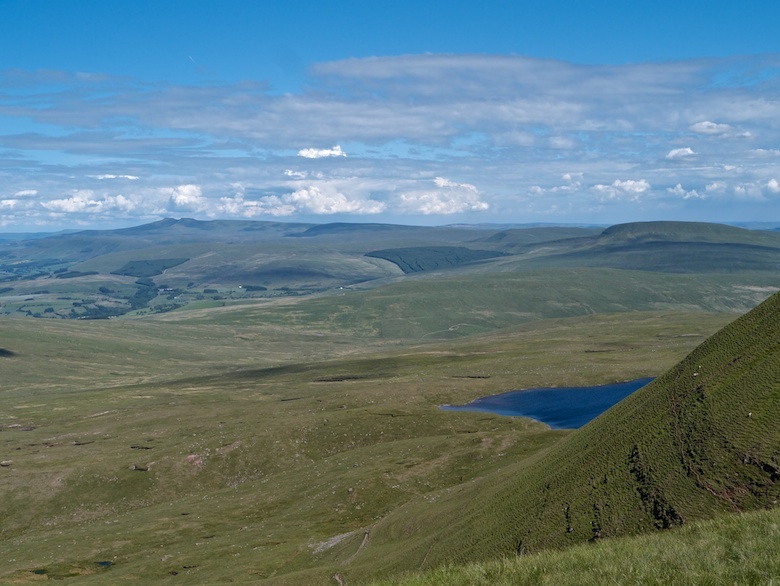 I returned last night after a superb weekend backpack around the Fforest Fawr area of the Brecon Beacons national park. Saturday was a scorcher and I got around what would normally be pretty boggy hills without even a hint of mud on my boots. 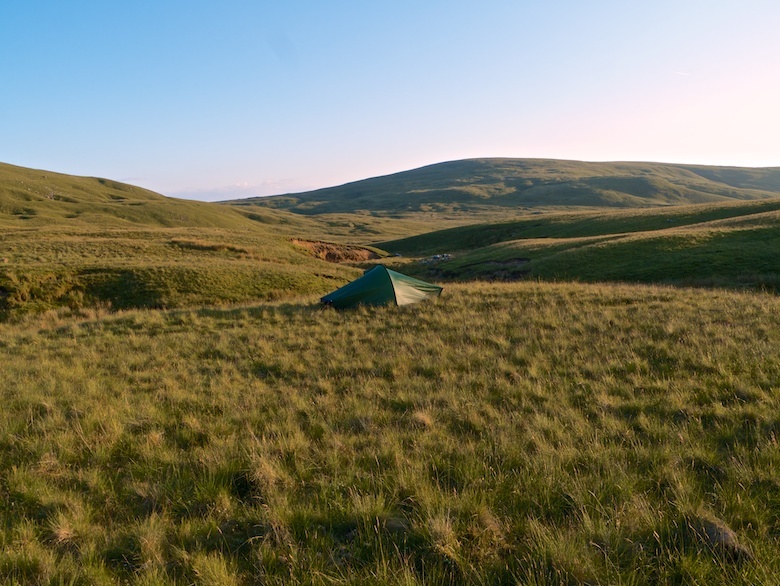 The day finished with a wild camp high on a hillside just under the 600 metre contour. That for me is what backpacking is all about. Sunday was altogether a different proposition. 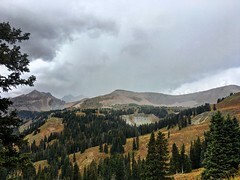 Persistent rain with low cloud draping the hills meant that almost no views were had. I decided to cut my losses and shortened my route, finally coming out of the mist which was down to around 400 metres. I had also forgotten to take my Thyroid meds with me which combined with the weather did not help my mood and energy levels that day! A return will be in order to complete the circuit. 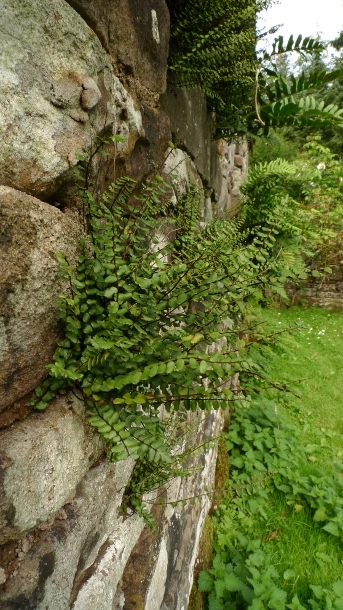 A write-up after I have finished my Borders ramblings and planned a backpack for this coming bank holiday. 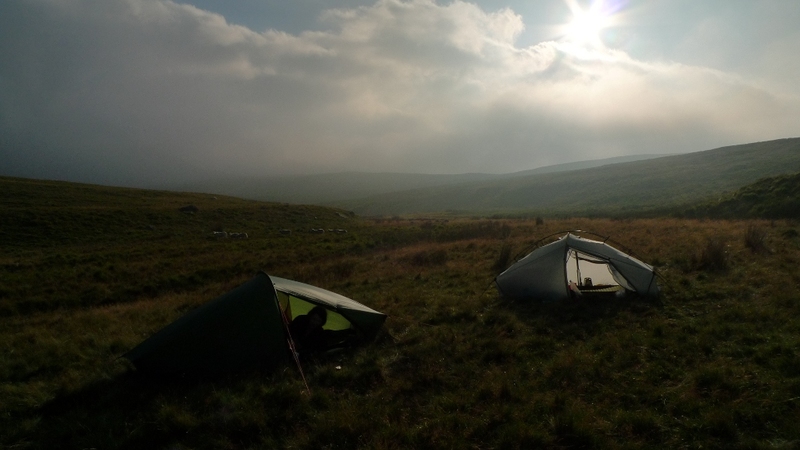 I got to test some great new kit this weekend in the rain too, so some gear based ramblings will also be on its way. Plenty to keep me busy. 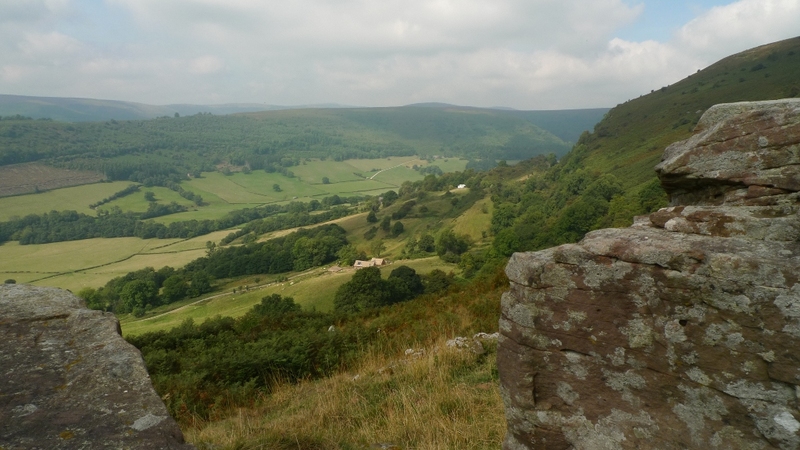 Sometimes the hills get in the way of this blogging lark! 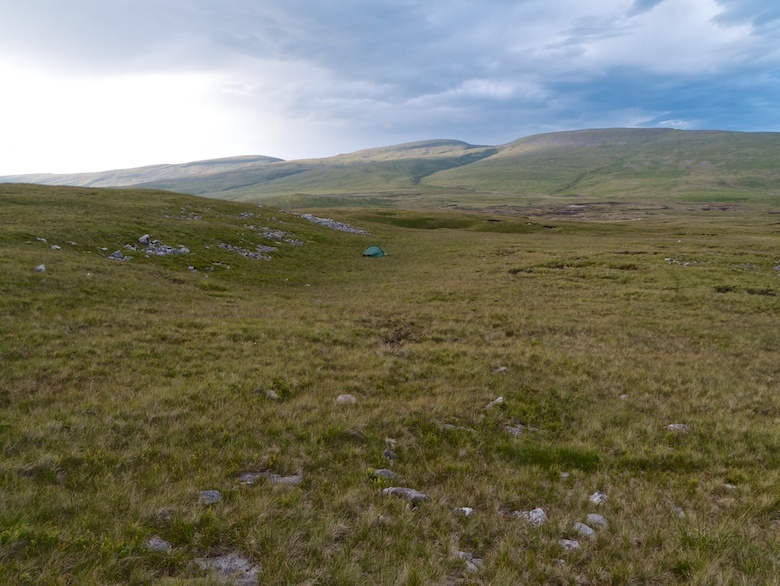 For now a photo of a great wild camp spot. 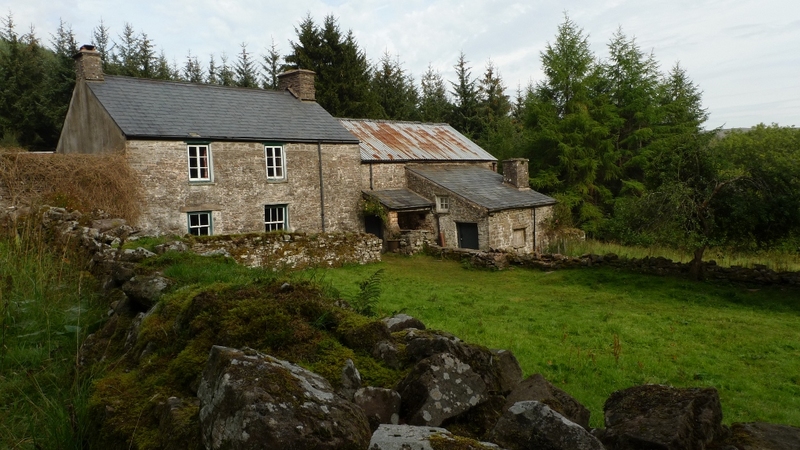 Last weekend I did a 4 day solo trip to stay in a remote farmhouse in the Black Mountains. I waited for the rush hour traffic to die down on Friday evening before the drive from Nottingham to Wales. 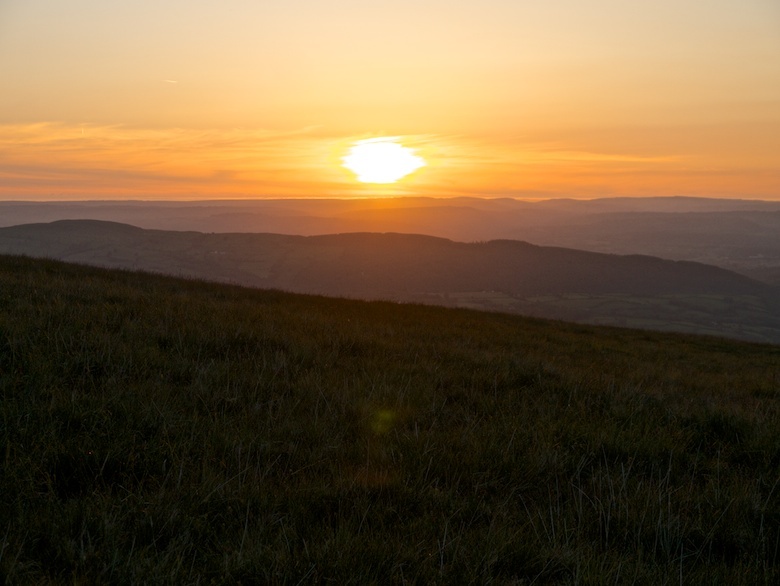 I was turning off the main road at Llanvihangel Crucorney at about 10pm to drive the few miles into the Grwyne Fawr valley. 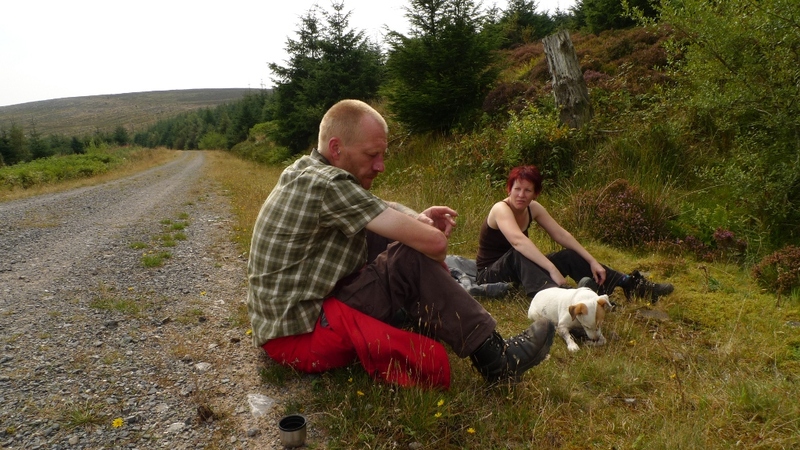 I soon arrived at the locked forestry gates, unlocked them and drove the mile to the farmhouse, first along a forestry track before bumping my way along a steep muddy bridleway. When I got out of the van it was pitch black and to welcome me an owl hooted in the forest. 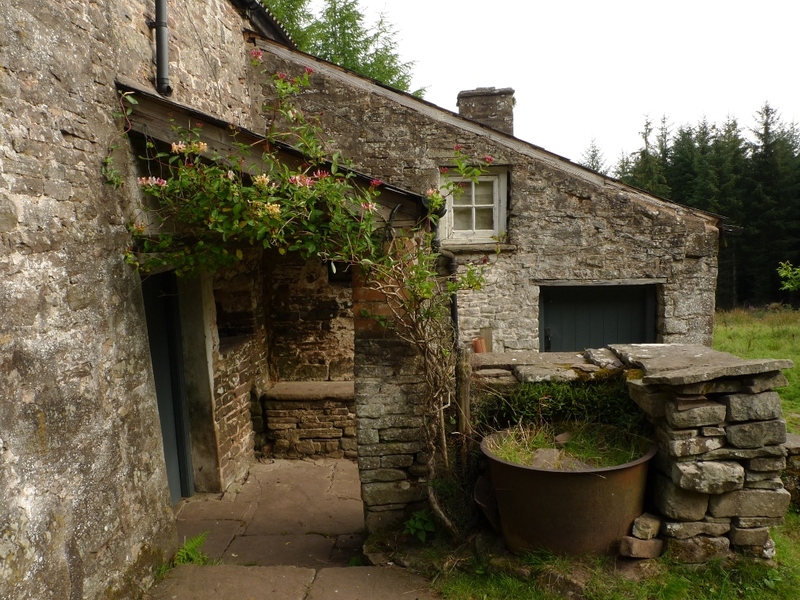 I was soon unloading the van and establishing myself in the farmhouse, lighting the gas lanterns (no electricity) and making some food as I was starving after the drive. It was too late to light a fire so it was off to bed in fairly spooky surroundings for a good nights sleep. Mac the owner met me the following morning for a days walking in the surrounding hills. 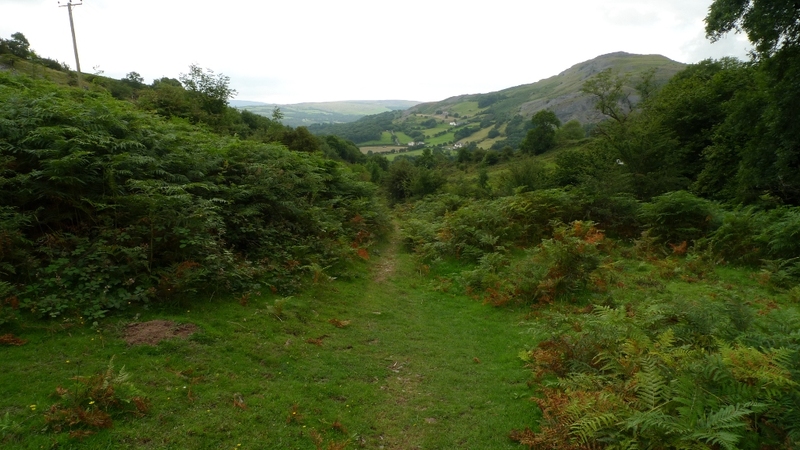 We were soon off climbing steeply through the forest to the col below Crug Mawr. 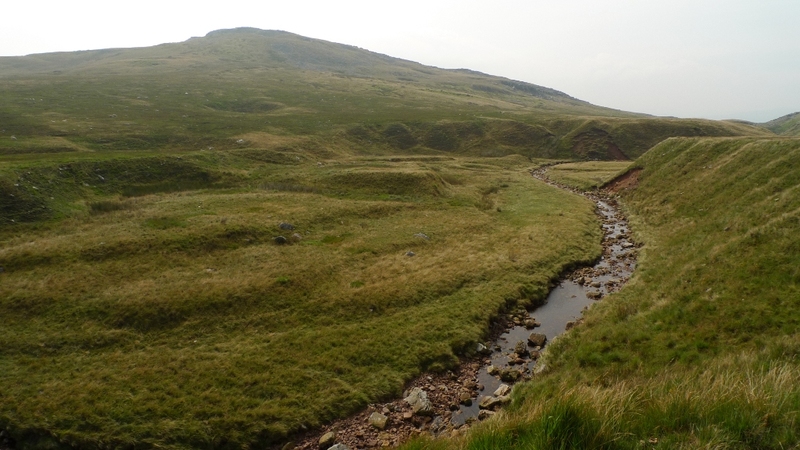 We immediately headed down a path following Nant y Ffin into the Grwyne fechan valley. Although cloudy and overcast there was a definite feeling of spring in the air and as we followed the minor road north there were large patches of snow drops along the road side. 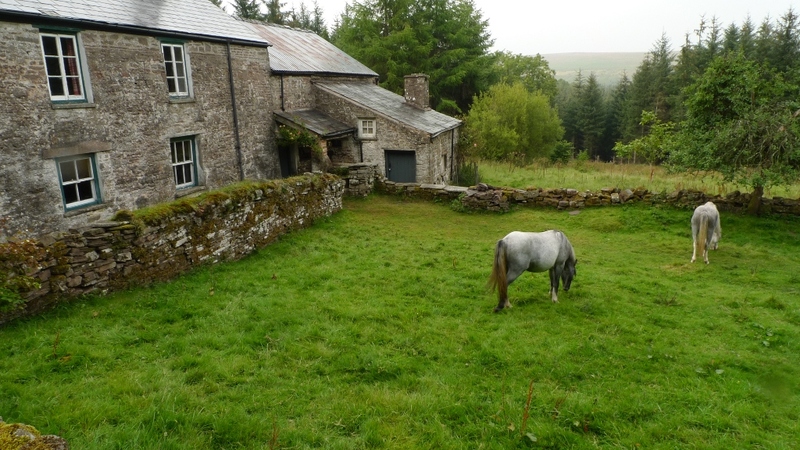 We turned off the road at the Hermitage and forded the Grwyne Fechan river to follow the watercourse of Gargwy fawr through the forest. 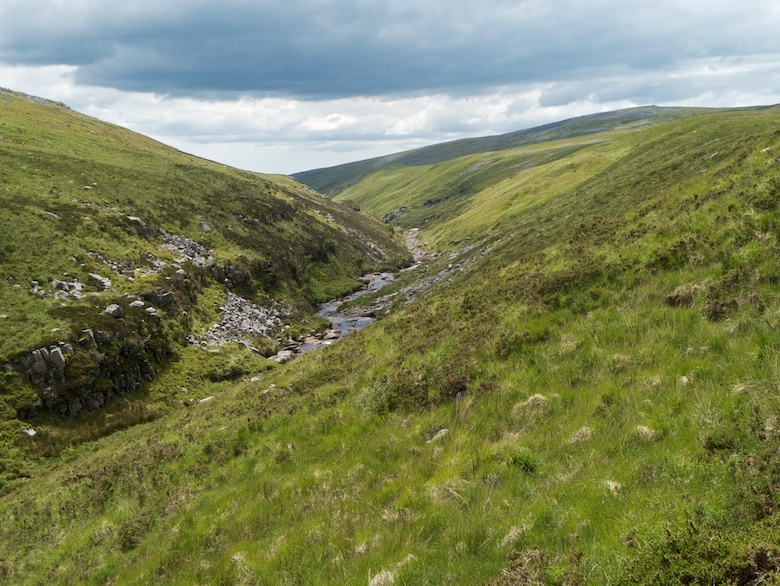 We soon emerged from the forest into a beautiful spot of open country, a place that I would like to return to pitch my tent one night by the river. 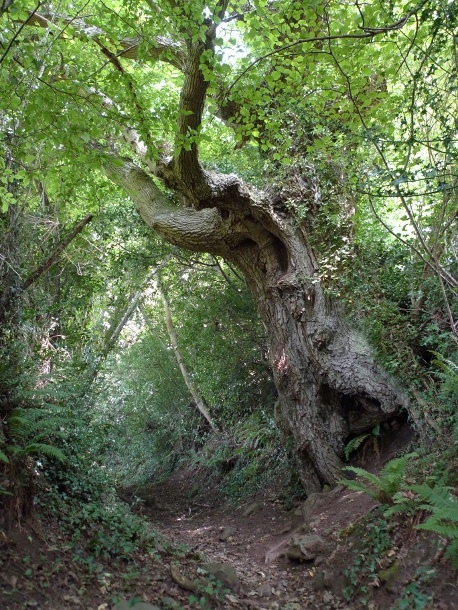 We continued following the watercourse onwards and upwards as it twisted though areas of hawthorn, scrambling up steep banks or splashing through the river to avoid getting tangled up in the thorny branches. 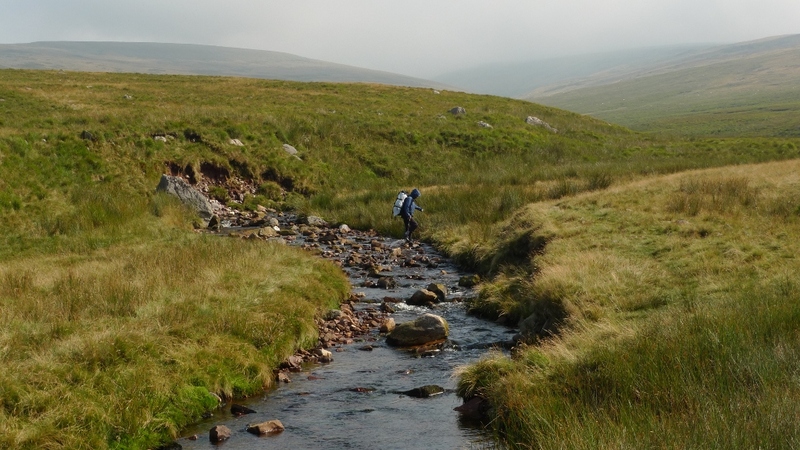 We soon reached the higher part of the river as it turned into the Gargwy Fach for the final steep pull onto the slopes of Pen y Gadair Fawr. 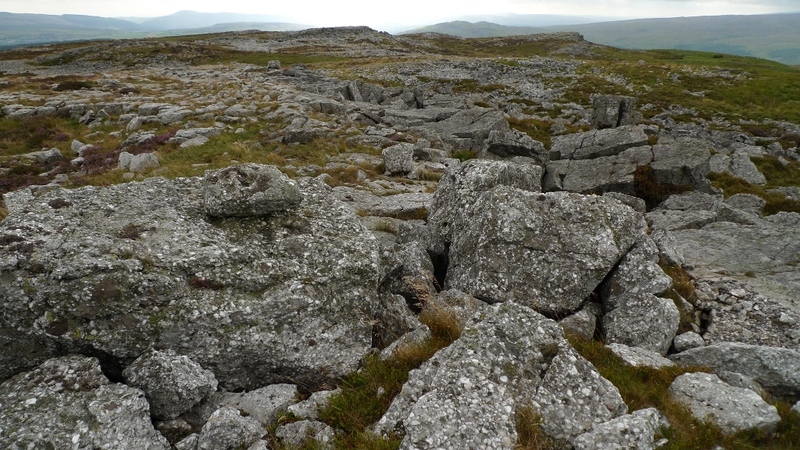 The temperature had dropped with height and there was a chill wind blowing as we plodded up to the summit of Pen y Gadair Fawr, past the last few remaining patches of snow. 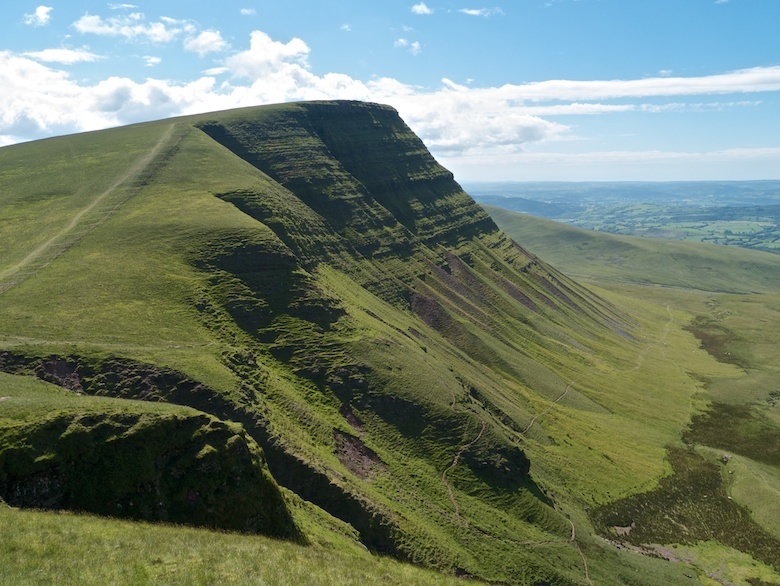 This is one of the best summits in the Black Mountains with far reaching views in all direction. 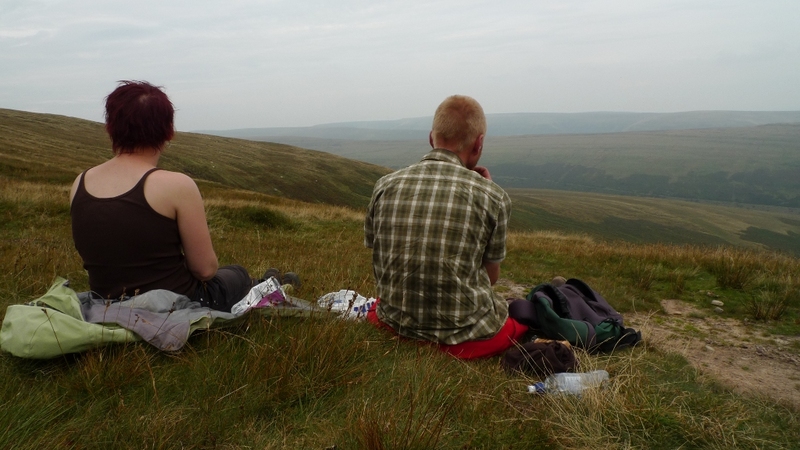 We watched as the first people we had seen all day were walking up the final slopes from the direction of Waun Fach. 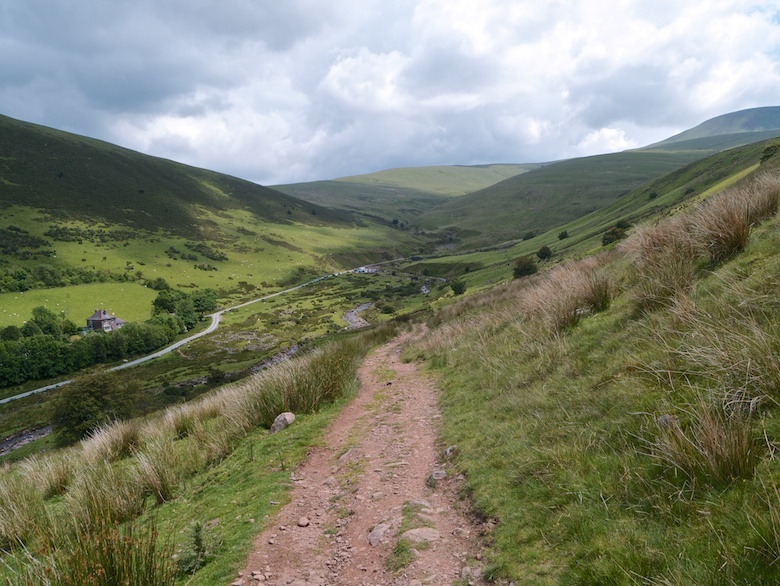 After a brief chat we headed south for a long stomp along the ridge via Pen Twyn Mawr to pick up a path down into Cwm Ffrwd to get back to the farmhouse. Mac soon left me to my own devises and I spent the rest of the daylight hours collecting dead fall out of the forest and sawing up logs for the night ahead. I would be on my own now for the following three days. 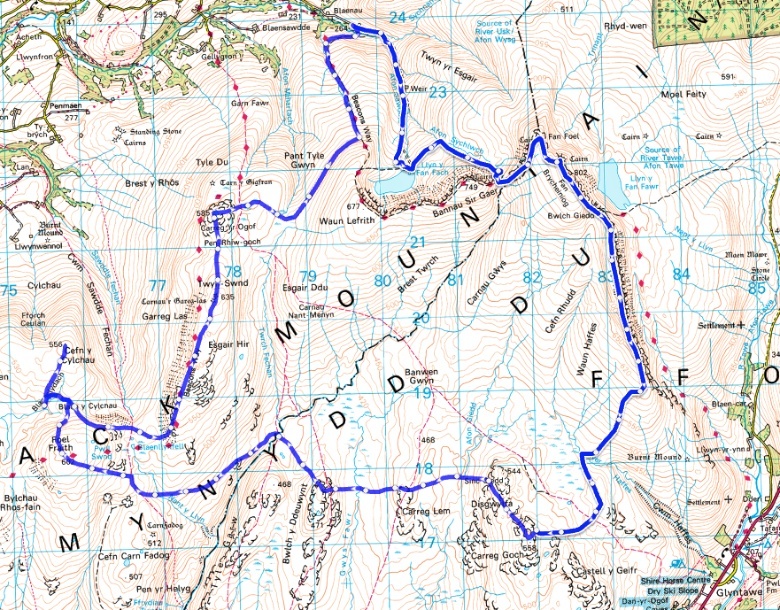 I spent the rest of the evening sitting by a roaring fire eating curry, reading and planning my route for the following day. 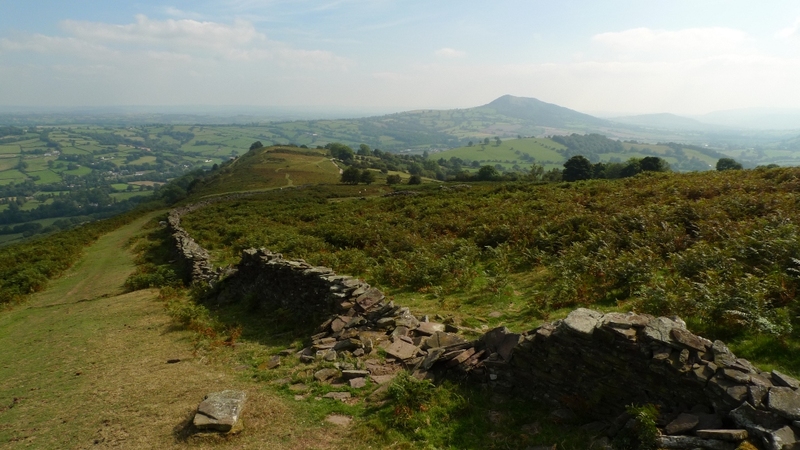 I decided that I would go a little further afield and climb the hills above Llangorse lake. The next morning I was driving down narrow twisting lanes with high hedges, praying that I did not meet any oncoming traffic. Often there was not any passing places for a mile or so on some of the roads. 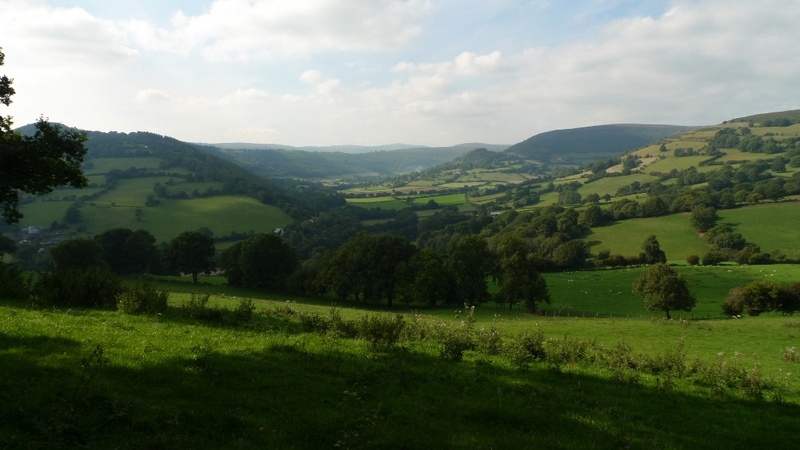 I parked up by the village hall in Cwmdu and headed up the ridge of Pen Tir in warm spring sunshine. 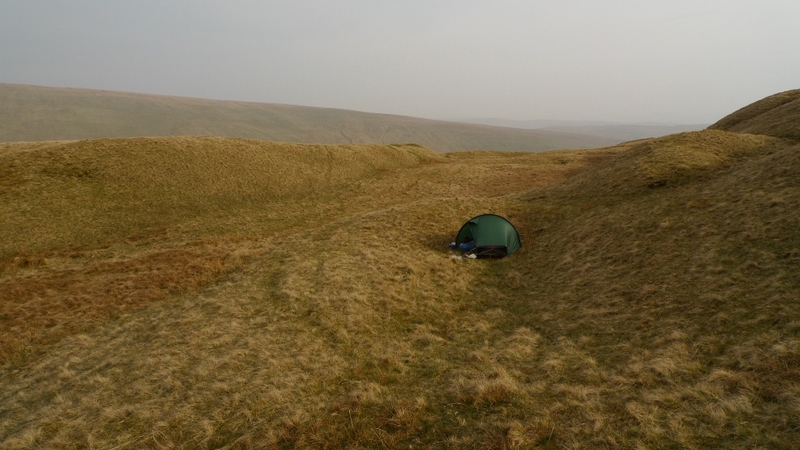 A lovely grassy track takes you easily along the ridge and it was here that I heard my first Sky lark of the year. A sound to lift the spirits and draw thoughts to long sunny days ahead (if we have long sunny days this year!). 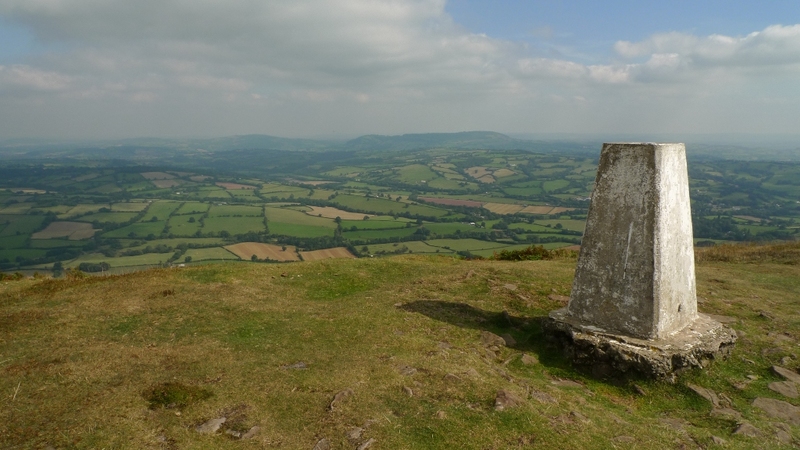 Another easy grassy track led to the summit of Mynydd Llangorse with views back to Pen Allt-mawr. 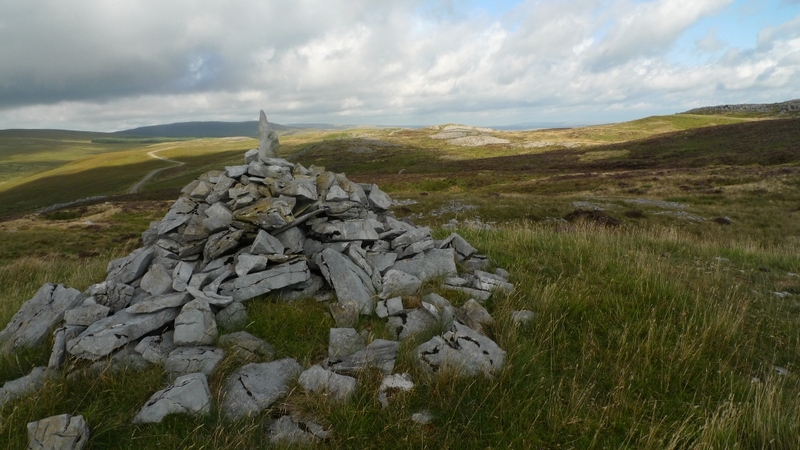 I wondered around for about 10 minutes trying to decide what was the actual summit as it was not marked by a cairn, after deciding on a spot I rejoined the path as it headed north down a narrowing ridge to the summit of the road through Cwm Sorgwm. The sunny weather had brought a few people out and there were several cars parked alongside the highest part of the road. 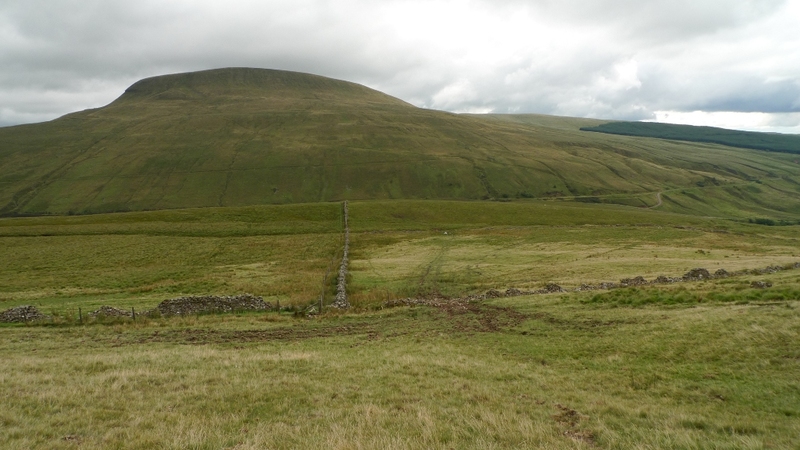 Mynydd Troed looked formidable as it towered steeply nearly 300 metres above me. It was grit the teeth time and steadily pod upwards to its summit trig with wide reaching views. 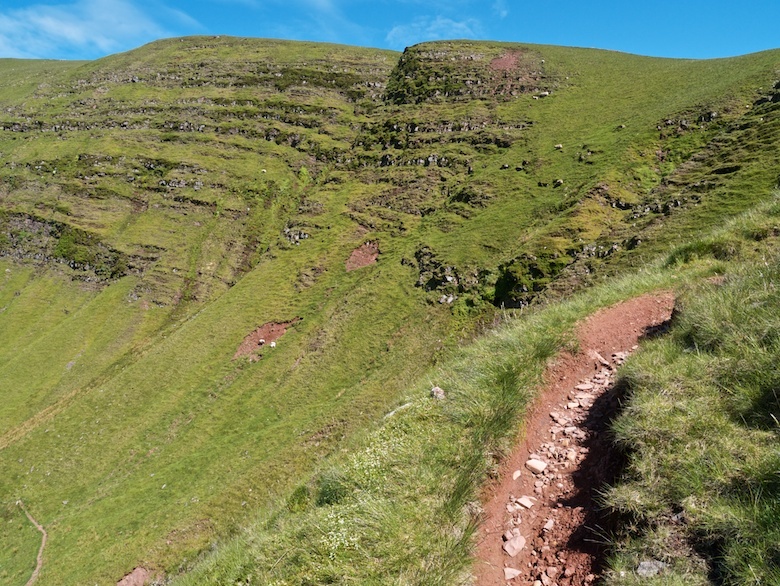 A narrow path leads along the full length of the hill before steeply dropping into a minor Cwm before hitting the road through Cwm Sorgwm. Here I found a concessionary path through fields that ran parallel to the road, a donkey entertained itself by following a foot behind me and stopping whenever I stopped! Made me a little bit nervous to be honest. A short stretch of lane brought me back to Cwmdu. Another night was spent along in the woods with not another person for miles. The usual routine of collecting and chopping wood then setting it on fire! 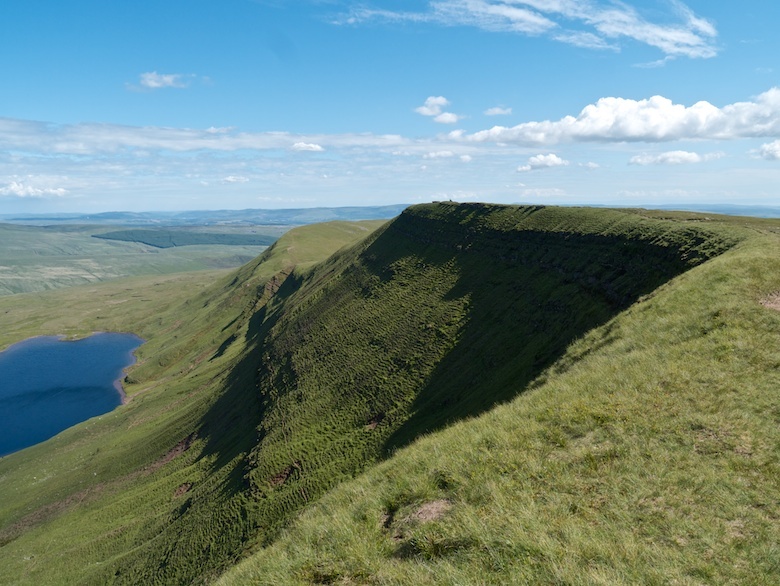 I decided the next morning to head to the Brecon Beacons to hit the high hills whilst the weather was nice, also being a Monday hopefully the hills should be quiet. 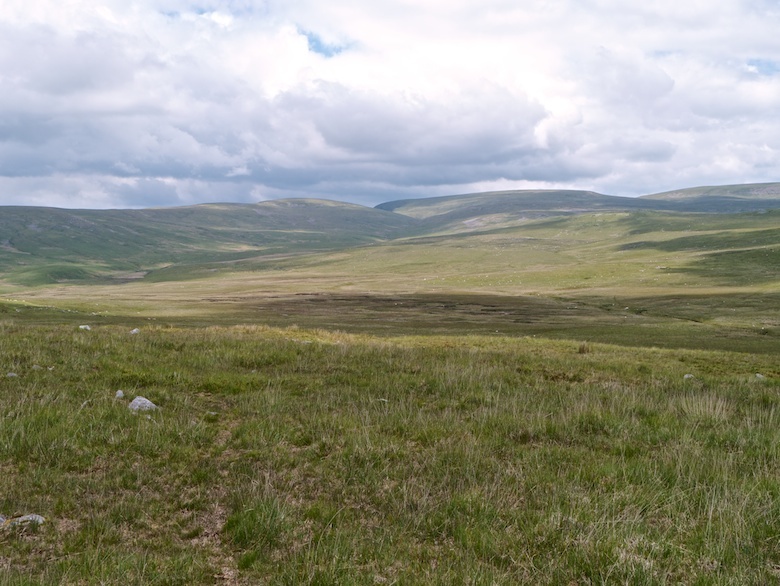 I was lucky to get a parking spot at the start of the roman road just south of Upper Neuadd Reservoir. 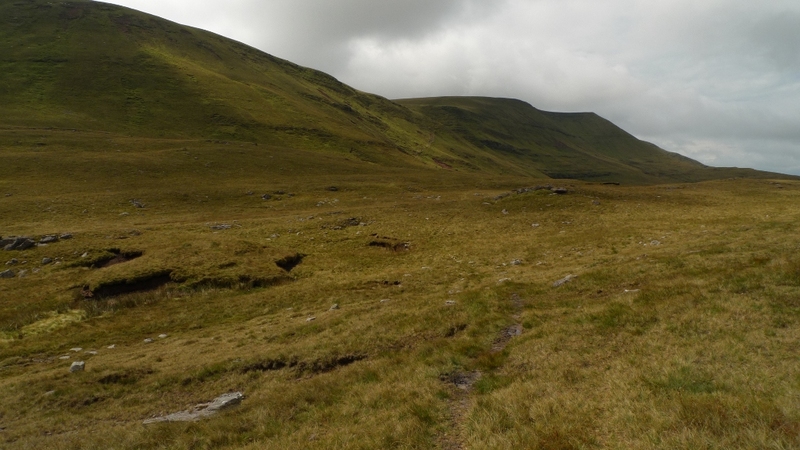 I headed up the roman road to the col between Fan y Big and Cribyn, a nice easy gradient to start the day. There were good views of the main hills from this track. 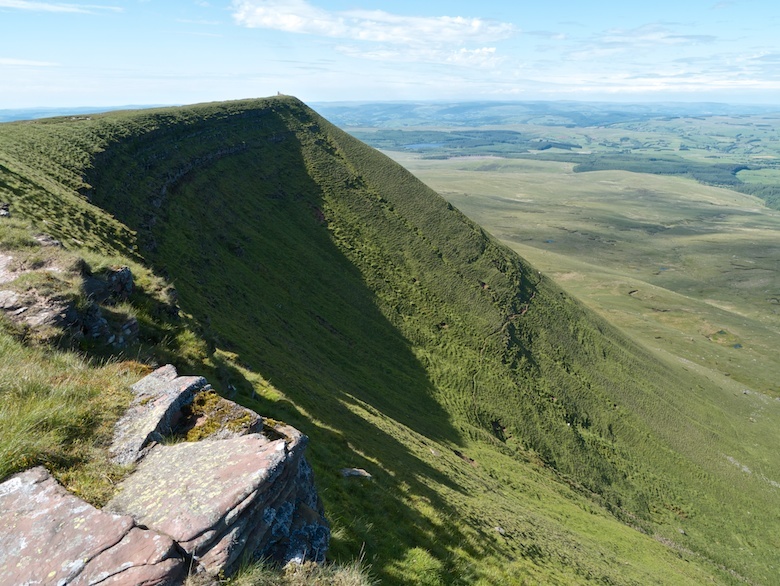 It was a steep pull to the summit of Cribyn which was the main reason for this walk, being the only hill I had not climbed in this part of the Brecon Beacons. 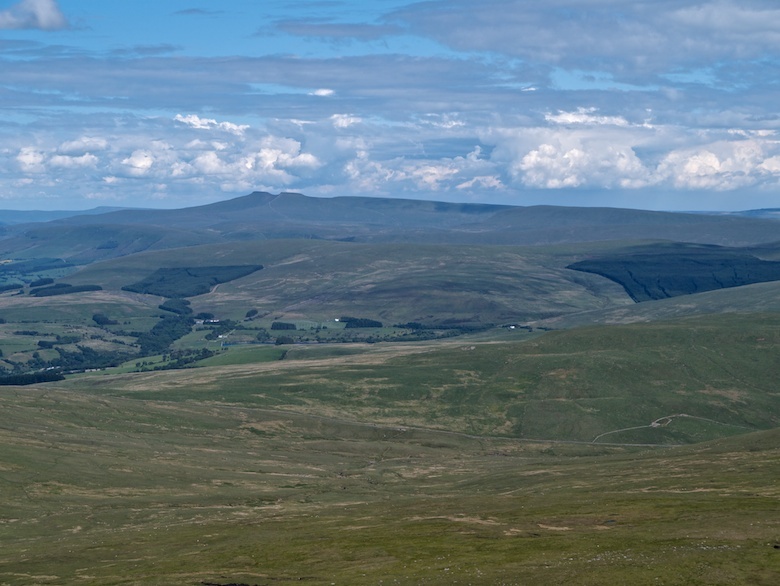 I particularly enjoyed the view back to Fan y Big, the hills here have a very distinctive shape. 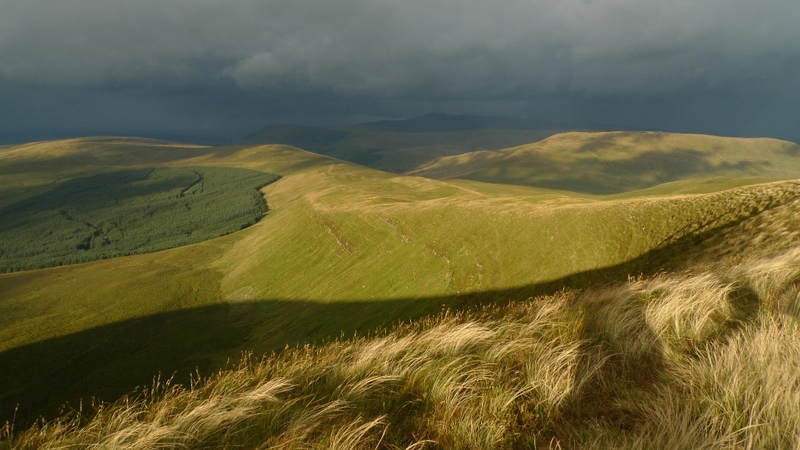 As I left the summit, there were a few spots of rain and the cloud started to lower onto Pen Y Fan ahead of me. I decided against putting on my waterproof trousers as hoped it would be a brief shower. 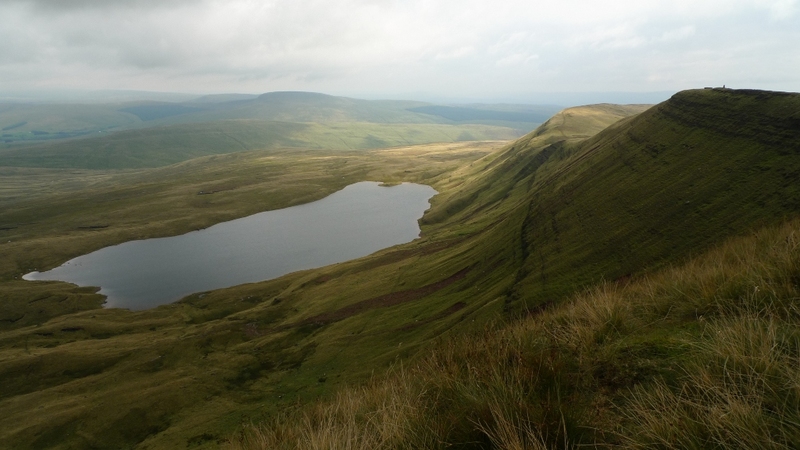 I was wrong and as I climbed Pen Y Fan the clag dropped lower, the wind picked up and it started raining heavily. On with the waterproof then to stop my trousers getting any wetter! 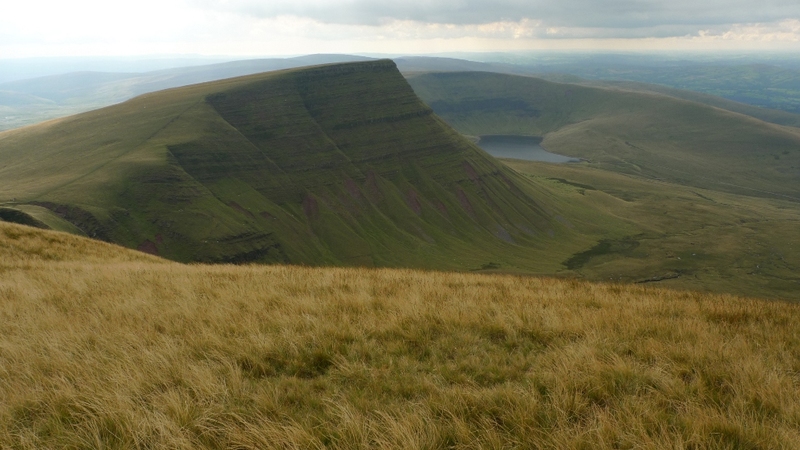 Due to the mist I decided to contour round Pen Y Fan and Corn Du and climbed onto the ridge of Craig Gwaun Taf. By now it was freezing with the rain turning icing with flakes of snow mixed in. I was disappointed with the lack of view as I had been looking forward to this section. The ridge narrowed but still no views on either side until suddenly the mist to my right cleared leaving cloud hanging in the valley below. The cloud soon swept back so it was hood up, head down until I could descend from the ridge and walk back to the van.